Feeding commercial rabbits for rapid growth should be a top priority of every commercial rabbit producer or even a backyard producer who wants to be efficient with money, time and effort. 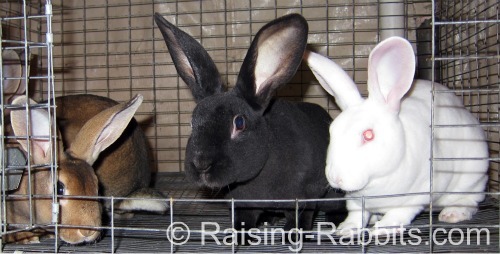 So, what is the best way to get the fastest growth in your rabbits? And, why should I care? For a commercial producer time is money. The difference between feeding for 8 weeks or 9 weeks may not seem like much, but every week you are feeding commercial rabbits costs you money and when you figure you are feeding 10, 20 or 40 rabbits an additional 1, 2 or 4 weeks, those costs add up. How much does it cost you extra? Well, depending on the cost of your feed, it can easily add up to several dollars extra PER RABBIT if you aren’t watching the bottom line. Young commercial rabbits eat and eat, only slowing down at around 6-7 months of age. Your rabbits should reach 5 pounds by 8 weeks, and then go straight to market. Let’s say you are getting $1.59 a pound for those 5 pound rabbits (average processor payment) or $7.95. Let’s say $8 each to make it easy. $8 x 40 rabbits is $320. And your costs? I figure on average that for me, it costs around $5.60 per rabbit to raise them to 5 pounds. My rabbits get to that weight around 8 weeks. My feed cost is around $0.28 a pound. It costs approximately 4 pounds of feed to every pound of weight you put on your rabbit. That includes the cost of your does and buck in your herd (i.e. overhead) included to cover all. So that is approximately $0.63 a week per rabbit. It cost you an extra $100.80 to grow out the batch that took longer. Guess who pays that? YOU DO! It comes right out of the small amount of profit that you make! Bottom line is you made almost nothing on the 12 week rabbits because they ate up all your profit! Instead of making $119, you now make $19. That’s a LOT OF WORK FOR $19, DON’T YOU THINK? If your rabbits take 12 weeks to get to market weight, you are feeding commercial rabbits up to 50% LONGER than you should have to in order to market those rabbits. If it didn’t cost you in pellet cost, then it certainly did in time and labor - your time and labor cost of feeding them, watering them, cleaning up after them. All of that impacts the bottom line. You could have been feeding the next group and making more money. You should have been half way into your next group of rabbits by the time your first set got finished. NOT to mention the fact that any deviation from feeding commercial rabbits a pellet-only diet opens your rabbits to health risks. If you regularly dilute the pelleted feed nutrients with low-nutrient hay and grass, you open your rabbits to eventual weakened nutrition, lower immune system strength, and reduced performance. Health problems can arise, such as infection, bacteria, viruses, pasteurella, etc. Any lack of impeccable cage cleanliness, for example, hay left on the cage floor that is fouled and then eaten, will perpetuate parasite life cycles such as coccidiosis. PLUS, hay and grass may be contaminated with incoming parasites, mold, mycotoxins, mites, or worse, depending on where they came from. Reduction in rabbit health increases your work load and decreases your income. A hobby rabbitry does not breed as intensely, and therefore can get away with trying various approaches to feeding. But a commercial operation has to feed optimally in order to stay profitable. Rethink your rabbit production practices if your rabbits aren’t market-ready by 8 weeks of age (see below). Ready to fix the problem? The BEST way to feed commercial rabbits is with a pellet-only diet consisting of high protein (18%), high fiber (18% or more) and low fat. By low fat I’d like to keep it around 2% or lower. If you have to cheat anywhere I’d do it on the protein, NOT the fiber. You can go as low as 16% on the protein IF YOU HAVE TO, but look hard to find good feed. Don’t go to ONE STORE and give up. Talk to the store managers. Go to the Purina Store Locator and find one near you and talk to that manager and ASK him about getting Country Acres in for you. Tractor Supply carries Purina but they are just a retailer not a dealer. They are NOT able to order it in. READ the labels on all of the feeds that you are considering. Make sure that you know what every item on the ingredient list is, even the strange words that you can’t pronounce; look them up. Make sure there are NO cheese or animal by-products in your feed. Rabbits don’t need this. Also beware of sugar or molasses as an additive. This is also something that rabbits do NOT need in their feed. Long fiber pieces in the pelleted rabbit feed is a good thing for feeding commercial rabbits. Are you feeding commercial rabbits a good quality pellets-only feed, and they are still not making weights? Then it’s time to brainstorm the problem by looking at other factors. If you are feeding a quality feed that is 18% protein and 18% fiber and you are NOT getting 5-pound rabbits in 8 weeks, it’s time for you to evaluate your stock and husbandry practices. You may need to make changes in your stock in order to reach those benchmarks. Rabbits4U provides info to our breeders on choosing stock, selecting a breeder, and questions to ask to ensure you are making wise choices. The quality of your stock can make or break a commercial operation. Look at the numbers we talked about in the beginning of this article – do you really want to feed the offspring of mediocre stock for 12 weeks? You get what you pay for. Quality stock is well worth its cost because it will definitely save you money in the long run. Cage space makes a HUGE difference in weight gain. 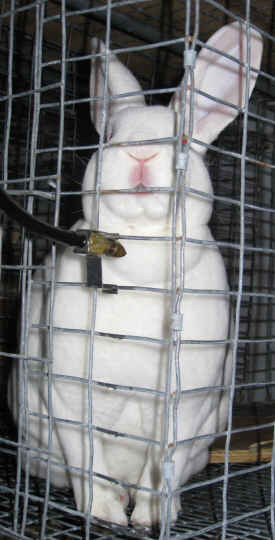 If your rabbits can freely bounce around the cage, they build muscle and gain weight. Ample cage space is not a waste, it is very important to your success. Other factors to consider when rabbits fail to make weight are diseases such as coccidiosis or other health challenges. Slow growth rates or losses in your kits can be signs of other husbandry problems.